With the weather warming up, we’ve had lots more enquiries from people looking for local, professional, reliable local air conditioning installation. Unified Electrical’s fully licensed Brisbane experts are more than happy to help! 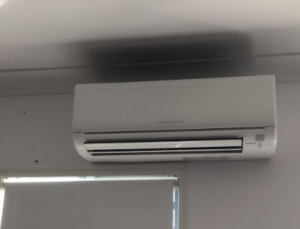 Check out this air conditioning installation on Brisbane Southside. Not only will this property be nice and cool in the summer but as a reverse cycle model, this client will also be able to heat their room in the winter. Unified Electrical are your local air conditioning specialists. We can install split systems or ducted systems for commercial or domestic premises to ensure a cool and comfortable environment. We install all major air conditioning brands and offer advice on the most energy efficient models to suit your budget and premises. Give us a call today if you’re looking for a professional air conditioning installation Brisbane and stay cool this summer!